The Online Giving site lets you set up automatic contributions and change the timing or the amount of your gift at any time. Please click on “Online Giving” link to create an account or to access your account information once initial account registration is complete. 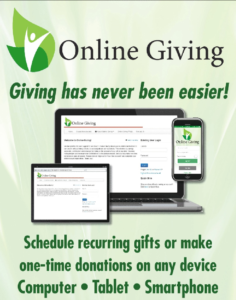 The Online Giving website provides a 128-bit secure browser connection to process your transactions and protect your information. By using Secure Sockets Layer (SSL) – you will be ensured that all of your information you enter is encrypted. To verify that SSL is active and functioning, look for the padlock or key icon on your browser prior to entering your information. Complete the online registration form and select the donations and the amount you would like to donate along with your bank or credit card information. It’s that easy!